Olga Neuwirth's name knows general circulation on these shores through the successful staging of her opera Lost Highway in 2008 by ENO at the Young Vic. That work, featuring libretto by Elfriede Jelinek, gained her publicity on the international circuit as a burgeoning and provocative talent active in the field of contemporary composition. Some negative criticism that attended Lost Highway referred to a perception that the musical content was sometimes reminiscent of the incidental music to a film. That criticism is here potentially transferred to a positive one then, as she gets the chance to display her work in film scoring and soundtracks on this new DVD release. The double DVD compiles nine pieces composed by Neuwirth to accompany film – or the other way round – with some of the films having been made by Neuwirth herself. The results are mixed but usually interesting, offering an impressive record of the Austrian composer's achievements in cinema to date at a still relatively early stage of her career. Another ambient, atmospheric work directed by Neuwirth is Durch Luft und Meer ('Through Air and Sea'), the imagery of which intersperses slow-moving shots of polar seascape with the mandala-like forms of ice crystals. Changes in visual content seem determined by changes in the electronically treated score, which is made up of processed samples from Neuwirth's orchestral and ensemble works. The film is as slow moving as the glaciers and icebergs it depicts, and has a distinctive lush beauty that is well matched by the overall static music, which is reminiscent in mood to something by Feldman. The analogue of music and image, on other works not always successful (for example on Eggeling's brilliant Symphonie Diagonale of 1924, which is better without Neuwirth's score, or any music for that matter), is strong here; and that apposition makes for a meditative work giving the audience a space to lose themselves in thought. An alien polar terrain, devoid of any sign of human life, displays itself in stratified shards of sea, land and sky, the camera drifting along the horizon while vague and static chords sift in and out. The landscape is a graphic score for the music, in sympathy with it, presenting images of nature that some might effusively call 'a symphony' or 'a harmony' of colour and form. The profile of mountain crags on the skyline shows the movement of frequency and sound wave on a different level. Some of the film work on show here can be seen as a commentary on how we talk about or describe music (Dickinson's 'the landscape listens' comes to mind). There is also something brought up generally as to the congruence, if any, of music and film enacted simultaneously (Canon of Funny Phases is the most overt if naïve example). 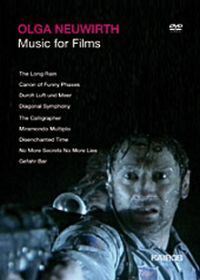 In the longest work on the DVD, The Long Rain, a crew finds itself crash-landed on a planet where a ceaseless deluge of rain falls torrentially upon them. The instrumental ensemble score 'mirrors' this deluge and the enervating effect it has on the crew of the ship, stranded on an alien planet, with sound and image eventually exploding into each other. The other works are mixed; as are the sleeve notes, which match a useful programme summary by Stefan Drees with a comically uninformative essay by Elfriede Jelinek that's reminiscent of a badly-written critical theory essay (though this may well be the fault of the translation). Overall an interesting release though.